Error Code C00CEE4F are generally occurring on Windows smartphone devices. There is not any good information about the issue but there is still a solution to fix this problem. The solution is easy. We are going to mention about that on this page. Please feel free to ask or contact us if you have any other question about this error or any other you have got with your Windows Phone (Mobile). Let’s begin to tell you how to fix the problem. Will I Face with WhatsApp Error Code C00CEE4F Again? Unfortunately there is only one fix for this problem and you will need to do hard reset to your phone. There are several different ways for several phone types. We will tell you how to hard reset Lumia 520 on this page. Let’s begin to tell you how to do that step by step, you can find lots of resources for other phones on internet. Close your Nokia Lumia 520 device. You will need to tap and hold on power button and volume down button of your device. You are going to feel vibration in a few seconds. Release volume down and power buttons. There will be “!” on your screen. Your phone will restart again. You will lose all datas on your phone. We recommend you to backup your important data to a computer device first. Otherwise it will be too hard for you to restore old datas which you have not backup. 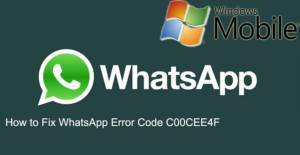 If you manage to install WhatsApp Messenger from Windows Store, you will hardly face with Error Code C00CEE4F. However we cannot tell you that it is impossible. ← Forgot WhatsApp PIN (Verification Code) and No Email Address, How to Recover?